After about a week fighting what might go down as the worst cold on record, I’m slowly returning to normal. I must have looked terrible last week- it felt like every single one of my coworkers looked at me and made a relived comment about how much better I looked today. Shhhh- I can show this one here and on IG, but not on FB, because I’m friends with the mom-to-be. First baby quilt up is for a sweet colleague who is expecting a little girl, her first child. She very sweetly mentioned her color preferences to me, and also that they like elephants- and then asked if she was being obnoxious. I told her I would so much rather have an idea of what would make her happy than to have to guess. So darn cute. And then the pattern ideas. I went through so very many. And then I stumbled onto a free patchwork elephant pattern from Hoffman Fabrics. Adorable, right? Of course- this finishes at 67×56- HUGE for a baby. So I decided to go smaller, and instead of 4.5″, I cut my squares 2.5″. And man, would I have saved myself some serious headaches if I had cut them 2.25″… exactly half. Because, math. Still ugh. The cute ditsy elephant print is going to be the solid inner border as well as the back. But with so many squares, that meant I got to pull fabric from stash. Hooray! I had to make a few HSTs- but the math for those, at least, was simple enough. There’s something so satisfying about squaring them up. Then came the fun of laying out the elephant! Now you totally can! With the help of google and some wonderfully helpful blog posts, I made my setting triangles and pieced MOST of the odd blocks. Astute observers might notice that there are 2 blank spots at the top of the elephant’s head. The math there (quarter square triangles w/ HSTs in the same square) got the best of me, but I’m coming back for them tomorrow. Damnit. Meanwhile, I started piecing the rows together and it’s making me so happy. This is my favorite kind of quilting- playing with color, cute animals, and a gift that will make someone smile. Now I just need to finish getting better, and hope none of the rest of the family gets it. Here’s hoping none of you are feeling lousy! 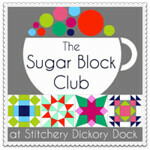 Linking up with Sew Cute Tuesday, Quilt Story, and Let’s Bee Social. Back in May, I started making some Scrappy Tripalong blocks. Because I’m nothing if not late to the party. (See also: my catvent, my plus quilt.) I’m not feeling rushed to get them done. I realized they’d become my backup project- ready to go when I’m between other projects, or not able to pay tons of attention (they are pretty simple blocks to make…) I thought my pile of leftover scraps from my Modern Cross quilt was huge, but in fact I had barely gotten started when I ran out of green strips, and then blue ones. That’s where I left you… 11 blocks, and in need of more strips. So, I spent a few nights watching True Detective while pulling apart my stash for blues, greens, and purples to cut into strips. When I had a huge pile good and ready to go, I got back to making blocks. I picking the fabrics for each one of these to be so much fun. Each one is a complete story all by itself, and then they end up all jumbled together. Years and years ago, I got THAT fabric at a quilting expo. I got two FQs, one in purple and one in white. I have had so much fun sneaking them into projects over the years. Because apparently I have the sense of humor of a 10 year old boy… Hee hee hee. I’m up to 30 blocks now. It seems like it should be more, but that’s it. I have decided to make this a queen+ quilt, to top our bed. So that means I need 70 more of these. Yikes! At least I’ve gotten far enough that I can start to play with layout ideas. Linking up with WIP Wednesday and Let’s Bee Social.